Audience member Gloria Williams (left) asking a question to the presenters during the Q&A. 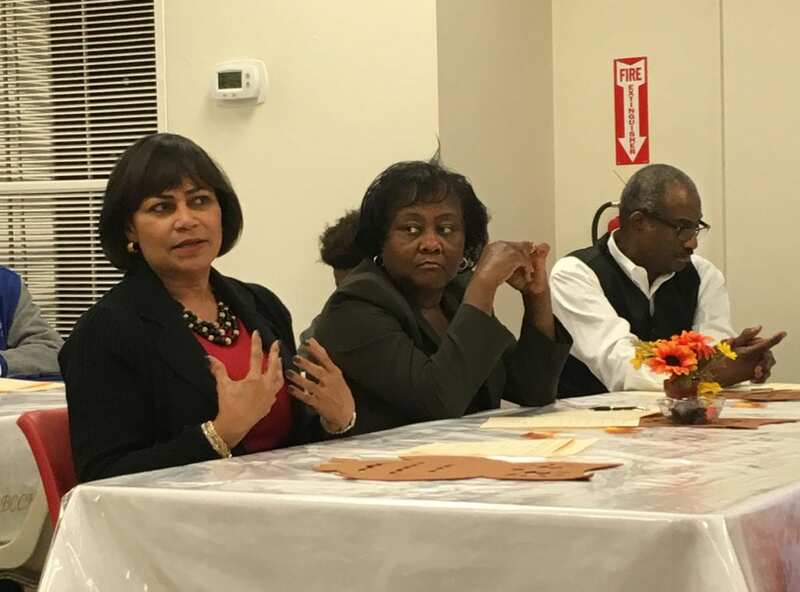 During a seminar held on Oct. 29 at First Baptist Church Capitol Hill, presenters on bullying, emotional abuse and the effect of suicide on families raised awareness to the African-American community. Kara James Johnson, co-founder and executive director of “The F.I.N.D. Design”, talked about bullying among youth and how it is not a trait with which people are born. “Bullying is a taught behavior; you don’t come out of your mother’s womb ready to fight somebody. That’s just not how it works.” said Johnson. Johnson also said that this kind of behavior could stem from family life and how a person is raised in the home. The seminar was part of an effort during October which is Bulling Awareness month. Social media plays a role in bullying among the youth as well, Johnson said. She explained how bullying among the youth is more viral rather than vocal or face to face. Dr. Roosevelt Faulkner, a licensed professional counselor spoke on emotional abuse and bullying, gave a short presentation on adult emotional abuse and the signs and indication on finding out if someone is being emotionally abused. “When we talk about emotional abuse, we are simply talking about psychological abuse,” said Faulkner. Faulkner explained the short and long term effects of emotional abuse. Some short term effects include fear and the victim identifying with the abuser which is known as Stockholm Syndrome. Some long term affects include depression, anxiety, and thoughts of suicide. Annette Lake is an advocate for the Tennessee Suicide Prevention Network. Lake is committed to helping others understand and navigate the complexities of mental illness. Lake lost both her father and son to suicide. Lake spoke about tips to take in order to cope and to make it though the loss of a loved one who commits suicide. Gloria Williams, a health care professional who heard Lake speak at a previous event, saw the benefit of the presentations. The main focus of the seminar is to raise awareness in the African American community to the fact that all races are affected by bullying, emotional abuse, and suicide. “We need more young people more active in learning and understanding what mental health is because unfortunately there are some people who are older and learned to mask everything,” said Lake. Lake wants young people to help out more and make sure that these topics are talked about not only at home, but in the classroom. “If there is a group that could take more action, then they could become the champions of mental health and helping people with bullying,” said Lake.